This is the ultimate interactive and customizable play mat package! 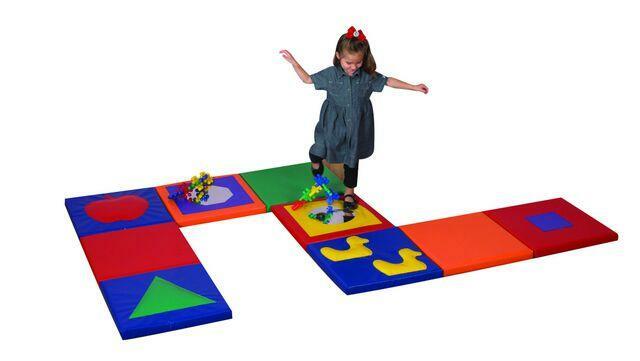 The Shape & Play Sensory Mat Squares is full of colors textures and sounds to delight children. Squares attach with hook & loop making this a versatile set that can be put together in any number of different ways. Make a trail use individually attach in a group its your choice! Each piece in the 9 piece set 20" square x 2" thick. Set includes: press on ducks that squeak an apple that soft and plump and sewn in mirrors on two pieces to further entice interaction and exploration. THIS ITEM WILL DROP SHIP FROM THE MANUFACTURER AND TAKE 10-14 DAYS FOR DELIVERY. Dimensions: L: 60" x W: 60" x D: 2"